There are plenty of tropical destinations around the US to choose from if you are planning an exotic getaway during the winter months. Since we visited Hawaii last year, we decided to pick a destination in the Atlantic or Caribbean for our next tropical getaway. Some last-minute bookings and we were all set to spend 6 days of our Thanksgiving holiday in 2011 in Puerto Rico. Miles of white sandy beaches, charming town of Old San Juan, warm and turquoise beach waters, rainforests, plenty of history, a diverse culture and good food; What more can one ask for? Where to stay: If you only have a few days in Puerto Rico, stay in San Juan. Preferably closer to Old San Juan. Flights to San Juan are the cheapest compared to other airports in PR. We stayed at Caribe Hilton which is a couple of miles from Old San Juan. I highly suggest renting a car to get around in PR. It gives you much more flexibility in terms of how much time you want to spend at a particular place. There’s plenty to do in Puerto Rico, so I am going to split up the blog into two parts. The first one is going to cover Old San Juan and our adventurous kayak tour to a bio-luminescent bay because these were major highlights of my trip. The bio-bay tour will surely be a memory I will live for years to come. The second blog (coming soon) will talk about all the other good things to do in Puerto Rico if you have more time – beach hopping, snorkeling, hiking and some more touristy stuff! Old San Juan: We started off our vacation by visiting Old San Juan. It is a town bustling with life! 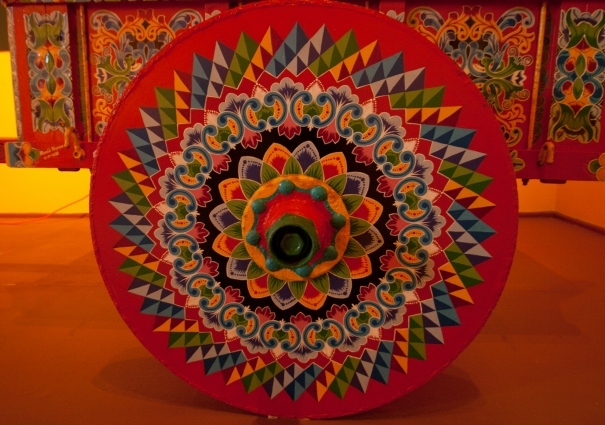 Vibrant colors define the town. 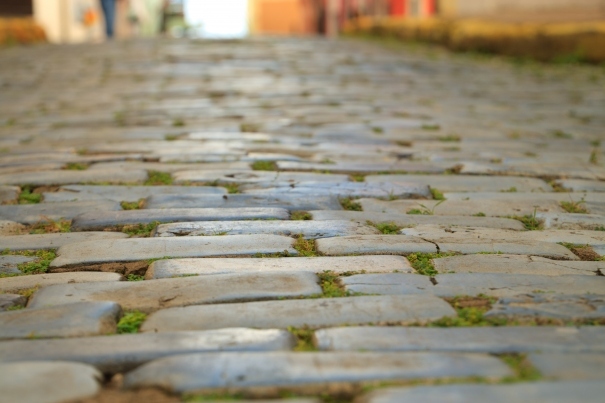 The best way to cover Old San Juan is to walk (probably 1-1.5 mile covers the entire downtown). Gopuertorico has a great walking tour which we followed. It really helps you save time and still cover everything that you want to. 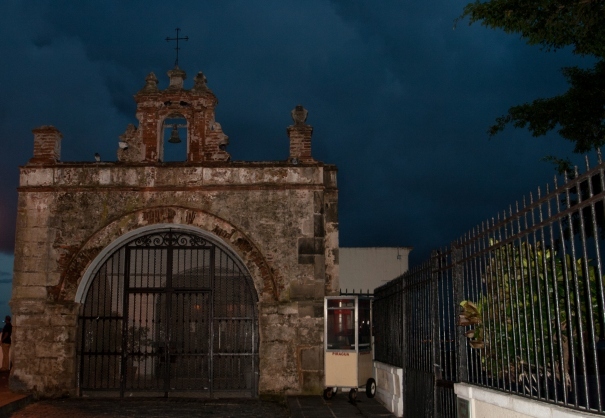 Whether it is the historic forts of El Morro and San Cristobal or the magnificent structures like La Rogativa or The Raices fountain, there’s plenty of history behind the town. 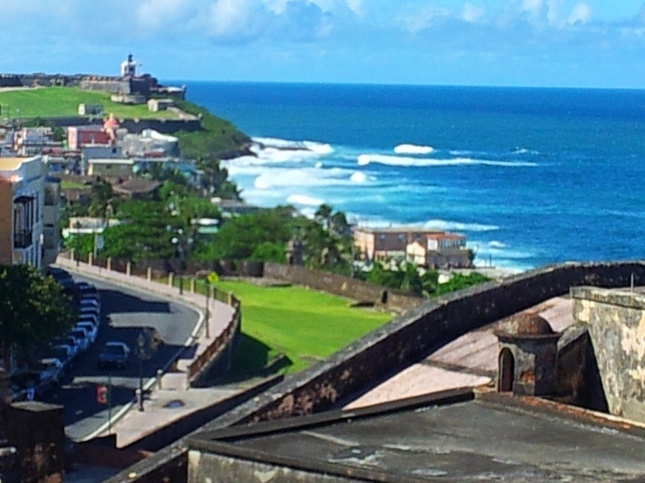 El Morro offers amazing panoramic views of the coastline and Old San Juan. 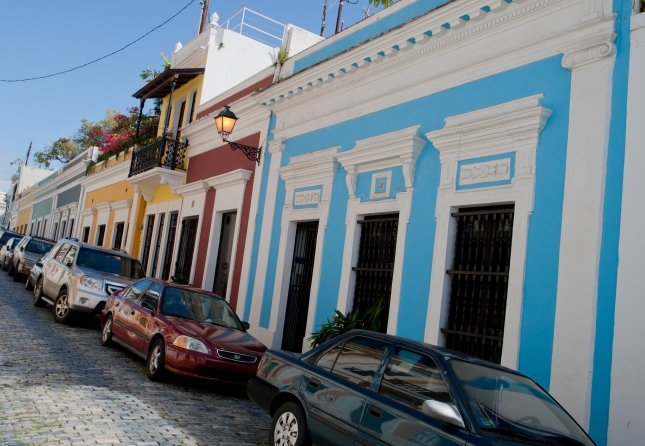 The blue cobblestone streets and local artists are other things that define Old San Juan. PR is extremely famous for shopping and as a souvenir an absolute must buy is a Vejigante mask. Night life is quite rocking and if you enjoy dancing, make sure to set aside a night for some Latin dancing! 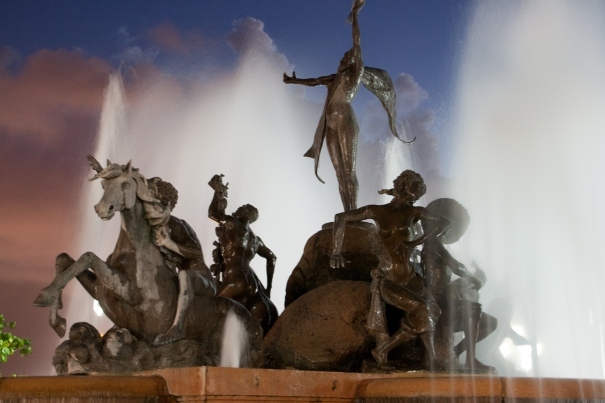 We frequented Old San Juan a lot in our 6 days, but a Sunday evening walk to the street that leads to the Raices fountain was mind-blowing. Witnessing locals salsa dancing on the street, lively latin music, street food: quite a treat to the eyes, ears and taste buds!!! Food and restaurants in Old San Juan: Puerto Rican cuisine is very similar to Cuban food. Don’t miss out on Mofongo – Puerto Rico’s signature dish. Few of my picks for restaurants in Old San Juan are – El Picoteo at historic El Convento Hotel (best tapas ever! ), Lupis Mexican grill, Tijuana’s Bar and grill on the pier (try the plantain enchilada). Apart from that, I highly recommend stopping for cotton candies, shaved ice and fresh pina colada at the various street shops. So San Juan was definitely a highlight of my trip, but the next thing I am going to describe will be a highlight of my lifetime! As far as I know, a bio bay kayak trip can only be done in Puerto Rico, skip the other stuff and spare time for this. You can snorkel and scuba dive elsewhere but not kayak your way through glowing water and glittery sparkles in a bay full of living organisms that emit light. Confused?? Read on to find out! Ever heard of bio-luminescence? People say that there are around 6-7 bio-luminescent bays in the whole world, most in the Caribbean, with 3 of the brightest in Puerto Rico. So if you are in PR, an absolute must do is taking a trip to one of these bays and experience the phenomena. Mosquito Bay at Vieques Island is considered to be the brightest, but if you are not staying at Vieques, the one at Laguna Grande in Fajardo is your next best bet. We choose to do a night kayak tour with Kayaking Puerto Rico. You have to kayak through mangrove channels in the dark to get to the bay. Once you are in the channel, you can touch the water to see that it glows with billions of bio-luminescent organisms! Its like fairy sparkles in water that vanish in a matter of seconds. I have never experienced ANYTHING LIKE THIS ever. Surreal and out of the world!!! Unfortunately, it is extremely hard to capture bio-luminescence in pictures and trust me some things are best left for your eyes to cherish and let you live in the moment. If there is ONLY one adventure you can do in PR, opt for the bio-luminescent kayak tour. Check the moon calendar before planning your planning tour since bio-luminescence is better on darker nights. And make reservations in advance during peak season. I highly recommend Kayaking Puerto Rico. The guides are amazing and make the overall experience memorable. There’s lot more to Puerto Rico, but as I mentioned earlier, this blog is about our most striking PR memories.